During my junior year, I took a biweekly OHG World History course, which was taught by my dad, Jim Bizer. 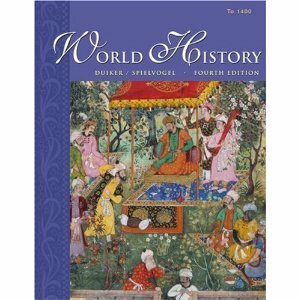 For this class we used the second half of the World History fourth edition text book by Duiker and Spielvogel. The class ran through both semesters. Between each class meeting we would read and take notes on our next chapter; we would sometimes spend more than one class covering a chapter depending on its length and subject. Also, as part of our assignment we would take a fifty question chapter assessment test. We would bring our tests and answers to class and my dad would check and them. I would go back and study areas of the chapter that I got questions wrong on. In class, we would review the main topics from the chapter and then open up a discussion about what we found to be the most interesting or surprising thing we had learned. Each student had to contribute at least one specific personal idea or opinion in these discussions. We would also talk about parallels we see between current society and the history we were studying. There were also two paper presentation projects that each student completed. I wrote my presentations about the Florence Nightingale and the practice of foot binding in china. I class, along with the other students, I gave my aural presentations of about these topic and used photos, charts, and other visual aids in the presentations. I also finished my research paper on the end of Mayan civilization that school year, and I have included it at the bottom of this page. By thoroughly taking notes and analyzing the textbook, completing the assignments and project, and participating in class, I gained a lot of knowledge about world history. We covered time between the 16th century and the early 21st century. I learned about major developments, people, and events of world history from the Renaissance through today. I also learned how to analyze and explain the course of historical events and how those events still affect our world today.